Flagship pricing should mean flagship design. The deep notch on the Pixel 3 XL isn't a huge surprise. It was first revealed in leaked photos posted by an XDA forum user on June 6th. Some people hoped, or prayed, that it wasn't real or could somehow be fixed before the phone's release. But as more leaks trickled out, including Engadget's own sneaky peek, it became clear that the notch was frighteningly real. Today, Google revealed the phone and its smaller notch-free sibling, the Pixel 3, at a glitzy event in New York City. I can't help but feel a tad disappointed. Google had more than a year to get this right. Essential unveiled its stunning PH-1 with a tiny circular notch in May last year. Then we had Sharp's Aquos S2 and, of course, Apple's iPhone X reveal in September. I can forgive Google for the Pixel 2 and Pixel 2 XL, as they were already so close to release, but the Pixel 3 XL? There's really no excuse. Google's latest and greatest should look better, not worse, than what came out in 2017. Compared to this year's crop of flagships, the notch is an eyesore. The OnePlus 6, for instance, has a shallower notch and will soon be replaced by the OnePlus 6T, which reportedly has a teardrop-shaped one. There's also the Huawei P20 Pro, the Lenovo Z5 and countless mid-range offerings from Honor, Motorola and Nokia. Some companies, such as Vivo and Oppo, are slowly figuring out how to ditch the notch altogether with pop-up cameras. There's a reason for the deep notch, of course. Both the Pixel 3 and Pixel 3 XL have dual front-firing speakers and a second forward-facing camera for capturing group selfies. These components had to go somewhere and Google must have felt they were worth the trade-off in design. Other phone manufacturers, however, have managed to balance looks with a dual selfie-cam setup. The Huawei Mate 20 Lite, for instance, has a small notch, while the HTC U12+ has slim top-and-bottom bezels. I wish Google had adopted either approach for the Pixel 3 XL, even if it meant ditching the speakers. The Pixel 3 is a better-looking phone, in my opinion. The display bezels are a smidge too large, but they give the device a better sense of balance and, if nothing else, a place to put your fingers while watching YouTube videos. The notch on the Pixel 3 XL isn't a deal-breaker, of course. 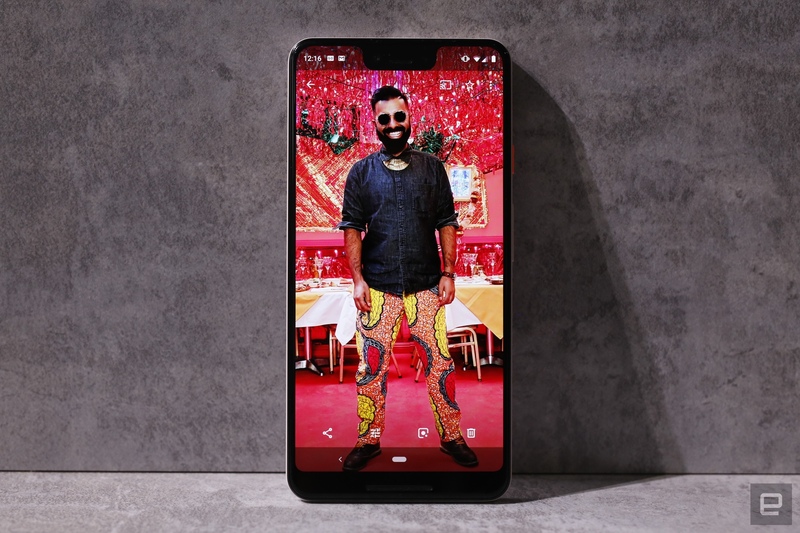 The handset still boasts a powerful processor, stock Android (with first-in-line software updates) and, in all likelihood, one of the best smartphone cameras on the planet. I like the improved dual-tone finish on the back of the device, too. The Pixel 3 XL is a flagship phone, though, with flagship pricing. If I'm going to spend $899 on a handset ($999 for the 128GB model) I want its design to be flagship quality. The notch, I have to say, really lets it down. Remember the original Moto X? I loved that phone. It was flawed, undoubtedly, with a distinctly average screen, camera and processor. But it also had a distinct and alluring sense of style. It was clear that Motorola, then owned by Google, had spent a lot of time on the design. Since then, of course, Google has reorganized and sold all of Motorola, aside from its experimental ATAP division, to Lenovo. The Nexus line is no more and we have a whole bunch of Google hardware, including Chromebooks and smart speakers, vying for our cash with a consistent and generally attractive look. It doesn't feel like Google has made much progress with its smartphone design language. The Pixel line showed promise when it debuted in 2016. The original Pixel and Pixel XL phones, produced in partnership with HTC, had large top-and-bottom bezels and a neat dual-finish on the back. They weren't perfect but you could see the direction Google was heading in. Last year's Pixel 2, also built by HTC, had the same bezel problem (ergh) and the Pixel 2 XL, manufactured by LG, was a welcome but hardly head-turning improvement. Looking at the Pixel 3 and Pixel 3 XL, it doesn't feel like Google has made much progress with its smartphone design language. Which is weird. Last September, Google spent $1.1 billion on the HTC team that worked on the original Pixel phones. That deal, I thought, would have made it easier for Google to execute its vision and deliver phones with groundbreaking design. I'm sure the unification has made a difference, but it's not immediately clear when you look at the company's new devices. To be clear, the Pixel 3 XL isn't an ugly phone. It's a perfectly adequate frame for Google's software, with a notch that makes me groan every time I look at. Maybe next year we'll get something that takes our breath away.